Saturday September 3- 1932. Did the house-work. Hattie here most of the AM Frankie [Pointain?] 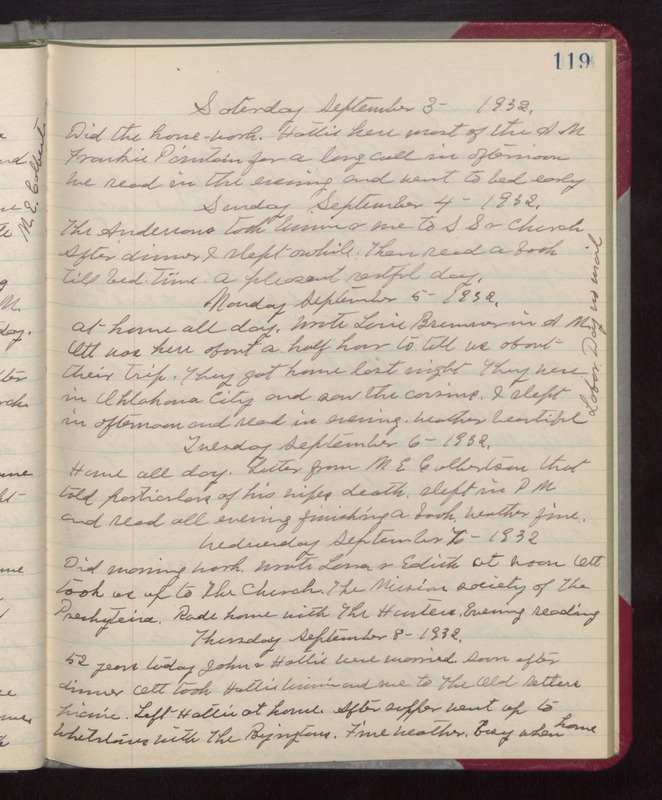 for a long call in afternoon We read in the evening and went to bed early Sunday September 4- 1932. The Andersons took Winnie & me to SS & Church After dinner I slept awhile. Then read a book till bed-time. A pleasant restful day. Monday September 5- 1932. At home all day. Wrote Louie Bremner in AM. Ott was here about a half hour to tell us about their trip. They got home last night They were in Oklahoma City and saw the cousins. I slept in afternoon and read in evening. Weather beautiful Labor Day no mail Tuesday September 6- 1932. Home all day. Letter from M E Culbertson that told particulars of his wifes death. slept in PM and read all evening finishing a book. Weather fine. Wednesday September 7- 1932 Did morning work. Wrote Laura & Edith At noon Ott took us up to The Church. The Mission society of The Presbyteira. Rode home with The Hunters. Evening reading Thursday September 8- 1932. 52 years today John & Hattie were married. Soon after dinner Ott took Hattie Winnie and me to The Old Setters picnic. Left Hattie at home. After supper went up to Whetstones with The Byingtons. Fine weather. busy when home.